Can You See All 12 Black Dots At Once? It’s no dress, but this optical illusion will surely make your head hurt. What you’re looking at is called Ninio’s extinction illusion. There are twelve black dots evenly distributed on the grey smocking leaf pattern, but your (dumb) brain simply won’t allow you to see them all at once. What’s up with that? It’s a variation of the scintillating grid illusion—which itself is a variation on the Hermann grid illusion. Any of these take advantage of lateral inhibition in the retina. In layman’s terms, this basically means that the stimulated light receptors in your eye can sometimes mess with the ones adjacent to them, making you see things that aren’t there, or not see things that are there. When the white disks in a scintillating grid are reduced in size, and outlined in black, they tend to disappear. One sees only a few of them at a time, in clusters which move erratically on the page. Where they are not seen, the grey alleys seem to be continuous, generating grey crossings that are not actually present. Some black sparkling can be seen at those crossings where no disk is seen. The illusion also works in reverse contrast. 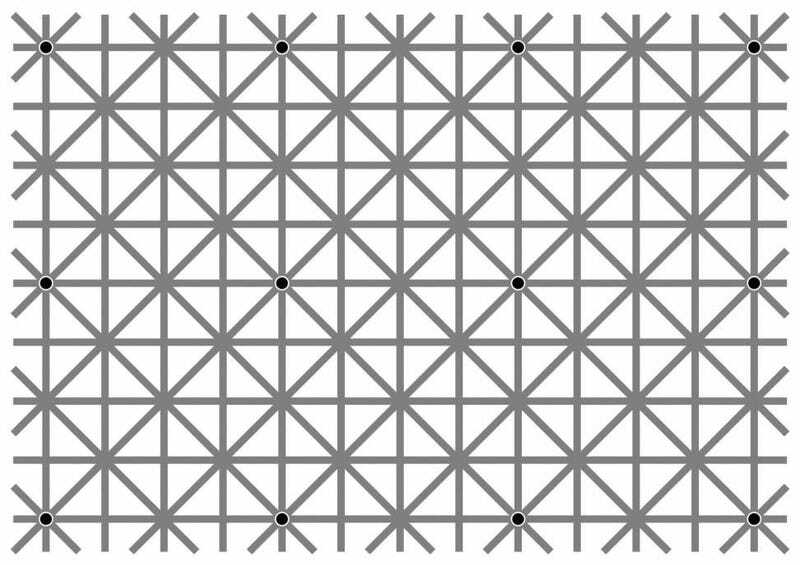 I can only see four dots at a time. One man reports his wife can see all twelve. How many can you see?